W.C. Fields wants to sell a film story to Esoteric Studios. On the way he gets insulted by little boys, beat up for ogling a woman, and abused by a waitress. He becomes his niece’s guardian when her mother is killed in a trapeze fall during the making of a circus movie. He and his niece, who he finds at a shooting gallery, fly to Mexico to sell wooden nutmegs in a Russian colony. Trying to catch his bottle as it falls from the plane, he lands on a mountain peak where lives the man- eating Mrs. Hemogloben. When he gets to the Russian colony he finds Leon Errol (father of the insulting boys and owner of the shooting gallery) already selling wooden nutmegs. He decides to woo the wealthy Mrs. Hemogloben but when he gets there Errol has preceded him. The Mexican adventure is the story that Esoteric Studios would not buy. The Great McGonigle’s (W. C. Fields) traveling theatrical troupe are staying at a boarding house. They are preparing to put on a production of “The Drunkard” (and do so during this movie). Cleopatra Pepperday puts up money for the show provided she can have a part (“Here comes the prince!”). Little Albert Wendelschaffer (Baby LeRoy) torments McGonigle all through lunch (“How can you hurt a watch by dipping it in molasses?”). In spite of being pursued by several sheriffs, McGonigle is able to keep going and see his daughter Betty happily married. Ambrose Wolfinger (W. C. Fields) wants the afternoon off (his first in twenty-five years) to go to a wrestling match. He tells his boss that he must attend his mother-in-law’s funeral. The afternoon is no joy. He tries to please a policeman, assist a chauffeur, chase a tire, and ends up getting hit by the body of a wrestler thrown from the ring. A series of mishaps leads his boss to send floral tributes to the house and notify the papers of the death (due to poisoned liquor). His shrewish wife, judgmental mother-in-law, and good-for-nothing brother-in-law add to his burdens. In the end he enjoys their fawning loyalty, a raise in pay, and his first vacation. Poppy, daughter of carnival medicine salesman Professor McGargle (W. C. Fields), falls in love with the Mayor’s son. Countess Maggie Tubbs DePuizzi is claimant to the Putnam estates, but McGargle and lawyer Wiffen plot to make Poppy claim the fortune. Wiffen and the Countess double-cross the Professor, but kindly Sarah Tucker notices a resemble between Poppy and the deceased Mrs. Putnam. It turns out that McGargle adopted the girl, she is the rightful heir, the purported Countess is only a showgirl, and every one has a happy ending. 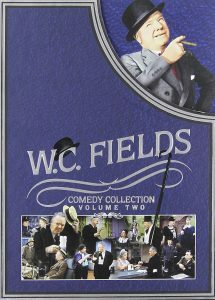 Sam Bisbee (W. C. Fields) is an inventor whose works (e.g., a keyhole finder for drunks) have brought him only poverty. His daughter is in love with the son of the town snob. Events conspire to ruin his bullet-proof tire just as success seems near. Another of his inventions prohibits him from committing suicide, so Sam decides to go on living..